This is an original and unusual tale; difficult to describe and impossible to forget. It speaks of another place and time in a locale only hinted at but never revealed. The names of the characters and places suggest the setting, but the reader is left to wonder. 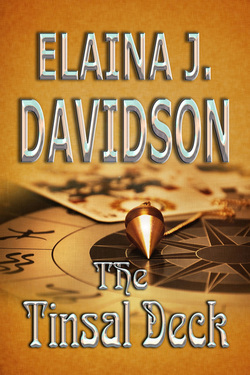 Zanderin the sorcerer and Bronwyn, the evil mistress he is bound to, have begun to use a mysterious Tarot deck in magical ways to direct the fates of individuals and their family members. The reader watches the cards of this deck being carefully and thoughtfully given out and slowly discovers the intertwined paths of the families Sindaland, Fairweather, Merripen and Hiller. This is an old society where wounds fester in the shadows because of terrible feuds and rivalries of the past. It is a place of mind games, hidden motives and calculated responses filled with nuanced meaning, calculated to gain advantage and revenge. Elaina Davidson tells this story ever so patiently, only revealing as much as necessary to keep the tale going. She doesn’t create frustration with this approach, just well crafted tension, and we feel our minds and perhaps our bodies too, being drawn to the edge of our seats. One by one the cards are played, destinies are dealt, and the endgame approaches. What part do we play in this life? How is someone’s destiny intertwined with our own? The Tinsal Deck leaves you pondering questions you may never have considered before.